Accent your wardrobe with this overcoat from Kenneth Cole. This herringbone coat features a modern three button front entry, classic notched lapel, and a stylish zipper bib. This men's classic overcoat is perfect for fall or winter. The approximate length from the top center back to the hem is 38 inches. The measurement was taken from a size large. Great Jacket But. . . This jacket was above expectations, however one should be warned the sweater shown in the picture is not separate it is a part of the jacket. Though it looks nice it is irritating. My issue with this jacket is the bib that is not removable. Other jackets produced by kenneth cole have removable bibs and is much nicer in situations when you want to go without it. 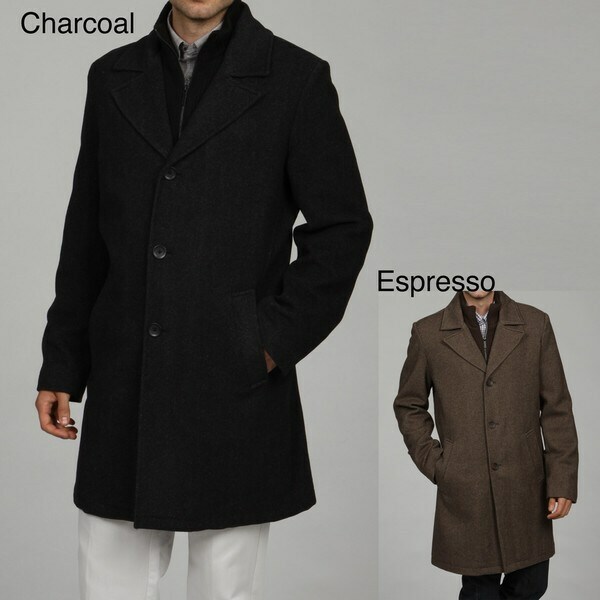 Great coat, it is very stylish and the fit is great for me I wear a 40L in a suit/sport coat. i ordered this coat in a large and it fits like a 40 long. The material is a little heavy so I'm sure it will be great for the Wisconsin winters. This is a great piece for any wardrobe, Fine style to laid back. This is truly a great value for the money. A classy, beautiful coat that is hard to beat at this price point. It's stylish but has a classic cut to accommodate a sport coat underneath. I am a bit broad in the shoulders, but narrow in the trunk so a size medium in this works best for me. Not as flattering as I would like personally, but that is because I prefer a trim, fitted look. The bib/vest is not removable, but adds some contrast and is a great alternative to a scarf. The bib is acrylic and polyester so it shouldn't irritate anyone with sensitive skin as much as a wool collar would. Although the acrylic (long term) is likely going to pill sooner than a cotton or wool blend would. Overall a solid value for the price, and a price you probably won't beat this side of a consignment store or eBay. A good coat for a good value, with style you won't pay out the nose for. This coat is very high quality and looks very nice. I would highly recommend it. Note the collar is not detachable. First off, I'm a huge Kenneth Cole fan. When the coat came in the mail, I was excited. Great fit, very warm. But... The expresso color was lighter than the one pictured on the site, which disappointed me. I thought about sending it back, but I don't want to pay a re-stocking fee on a coat I like anyway. It's still a great coat, but be forewarned the actual expresso color is lighter than the pictures. Now I have to tell you this: I was waiting for this coat in Expresso, but it seemed to sell out everytime I checked. Last week, the price dropped to $96 and there was an expresso in stock, so I clicked it into the shopping cart. There was a message that read, "Only 1 Left". So I rushed to buy it. Being the suspicious person that I am, I checked the inventory a few hours later and discovered yes, I'd gotten the last expresso Kenneth Cole Herringbone coat at a great price. Until the very next day. I went to Overstock again and found the same Expresso coat on sale for the same price... after the site had told me I had gotten the last one. So I added it to the shopping bag and... guess what... there was a message that read "Only 1 Left!". I smiled because I knew there was something sneaky going on. But I have no regret because it's a Kenneth Cole at a great price. Still, I wish the expresso color was a little darker and richer. Or at least lighten the photos on the site to better reflect its true color. This Kenneth Cole coat is a steal. We purchased this coat in a charcoal color and it is a high quality material and can be dressed up or down. The charcoal color is a dark grey (closer to black) so you get to play on this color when pairing the coat with different outfits. It is wearable for work or a casual outing. It's contemporary, chic, and cool. There is no need for a scarf with this coat! It's easy to wear and the pockets are perfectly placed. Also, it is a great length for a guy. This is an excellent gift - we want it in the Expresso color now! I bought this coat for my son for Christmas. I knew his size approximately, but thought the arms would be too long for him. He tried it on and it fit him perfectly. It has the perfect length, above the knee. the liner is like a sweater that zips up to the chin which eliminates the need for a scarf. It is made of soft herringbone. I would have paid so much more in any store, especially for Kennith Cole! What a terrific find. i was genuinely pleased with the quality. I highly recommend this coat. Purchased for a 20-something guy, loved it. very stylish, good wool weight. hem is mid-thigh length as the photo shows, may not work for shorter men. I like the coat, but completely missed the fact that there is a mock sweater attached to the inner lining. Therefore, it's just not what I expected. The picture shows the sweater, but I just thought it was what was being worn underneath the coat and not permanently attached to it. On the one hand, it keeps me warm. On the other hand, you can't wear a scarf. But I hate to pay to return stuff when it's my own fault for not catching something like this. Oh well. I purchased this overcoat for my husband to use for work. The sizing is perfect. The color and fabric complimented the coat nicely. He espcially liked the sweater collar that zippered and said no more lost scarfes! I am returning to Overstock to buy this coat in the brown. LOVE IT! Collects a lot of lint and doesn't wash up well when dry cleaned. Great coat with a lot of quality and is warm. I get a lot of complements. I would recommend this coat. My husband wears it every winter for the last few winters and loves it for casual and dress up. High quality coat. Love it! Nice coat, my husband really liked it. The only negative is that I wish the inside collar were removable...its sewn in. I knew that when I bought though, and am happy with it regardless. Looks more expensive than it is, and it's very warm in cold winters. Liked the look of this overcoat. It's stylish and warm. I receive compliments on it almost everytime I wear it. It is a good purchase. Warm and stylish!